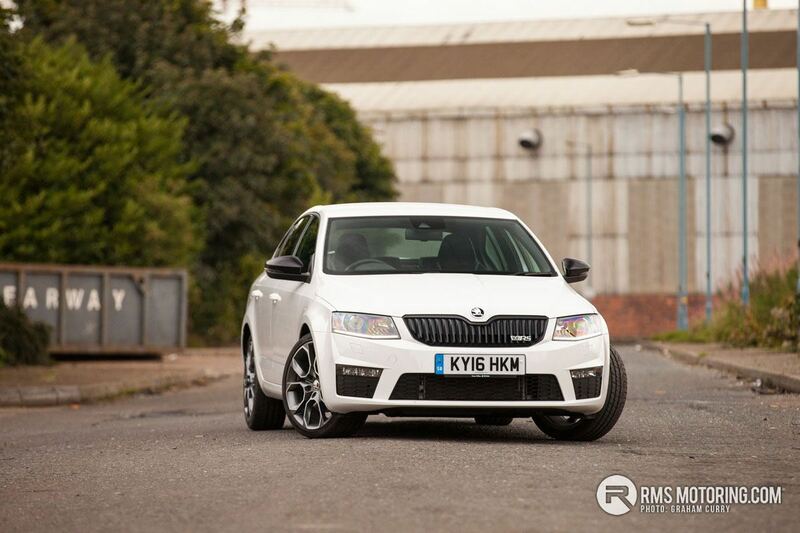 Being a fan of Skoda, namely the vRS model range I was looking forward to this test model from Skoda UK recently, as it to me is everything a car should be. Large yet practical with some sporting heritage providing a fantastic driving experience with enough oomph to boot. 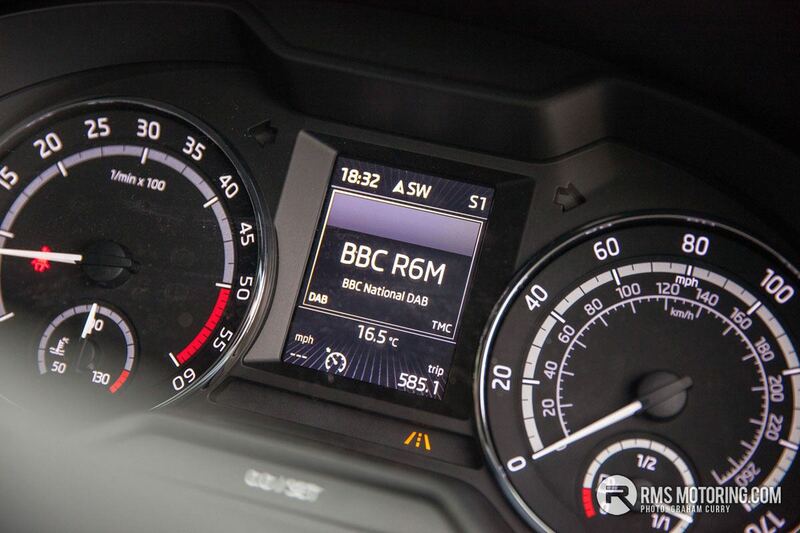 Welcome to the latest Skoda Octavia vRS 4×4 TDi DSG. 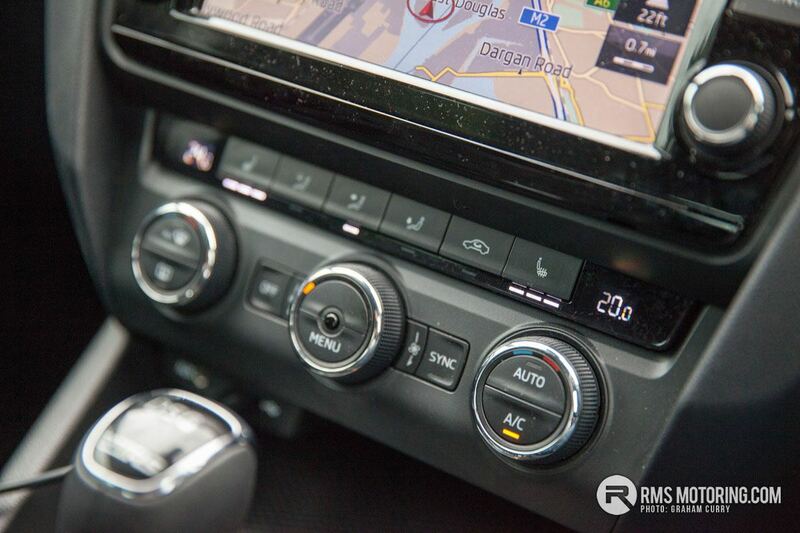 Now that that mouthful is done and dusted, let’s see what the Czech manufacturer can offer with this latest model, and from that mouthful alone I see stuff that would attract me to the car instantly, such as DSG, vRS and 4×4. At a glance the Octavia is distinctive with very sharp body lines, accentuated with the LED lighting and despite the general silhouette not changing much since the Octavia first started production, the lines and overall size have progresses with time. vRS badging is prominent around the car and the red brake calipers certainly mean business behind the 18” alloy wheels, on the road over the last few models white, blue and green seem to be the most popular choice so it will be interesting to see what colour trends are like with the latest version. The rear of the Octavia has a boot spoiler, LED lighting an dual ‘letterbox’ exhausts in the black rear valance, just above which is a red reflective strip, running the full width of the rear bumper. 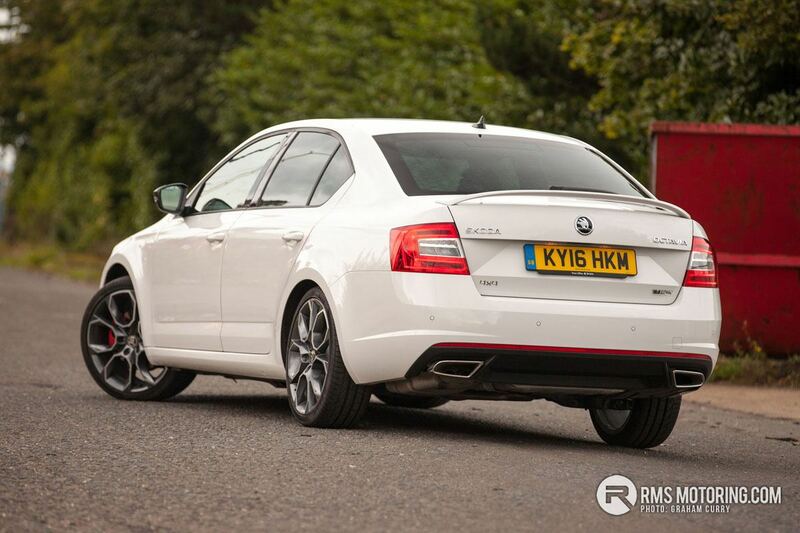 Parking sensors at the rear seem to be a standard fitment on the vRS also. 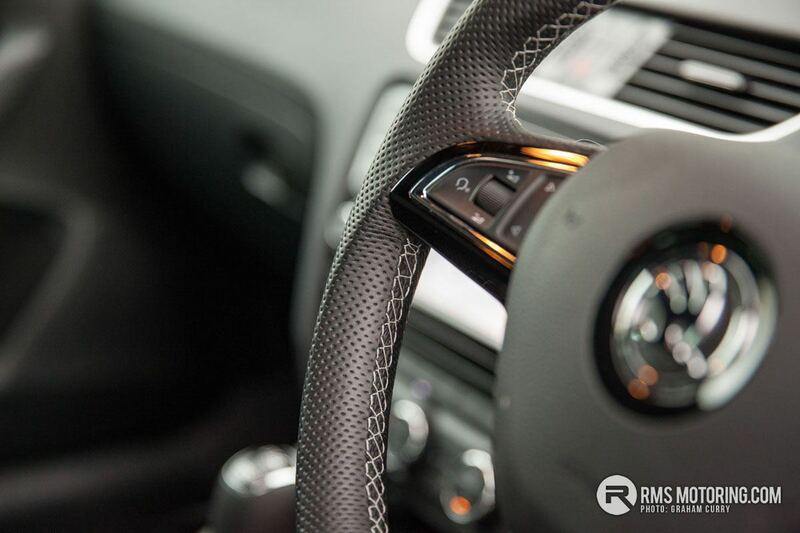 I touched earlier on my love of the vRS models and also how practical the Octavia is, well in fact, until very recently I owned a ten year old Octavia vRS, and I must admit it was an ownership that had to be ticked off the bucket list. Asides from the potent petrol engine found in the car I owned, it had a boot that could swallow all of my camera equipment with ease and then some, 3 wooden pallets with the seats down if the truth be told and the load space in this latest model is equally as impressive. 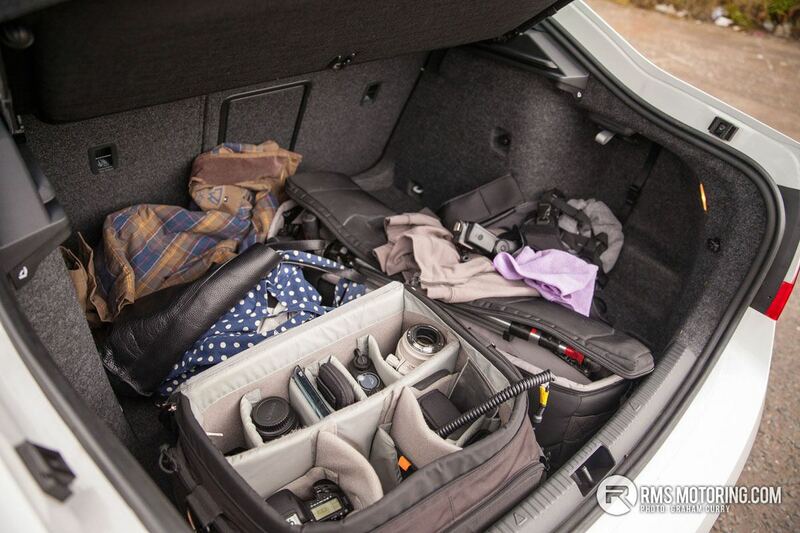 The boot is massive and for a hatchback, very usable indeed suiting the needs of any family, sports enthusiast, outdoor adventurer and golfer alike. 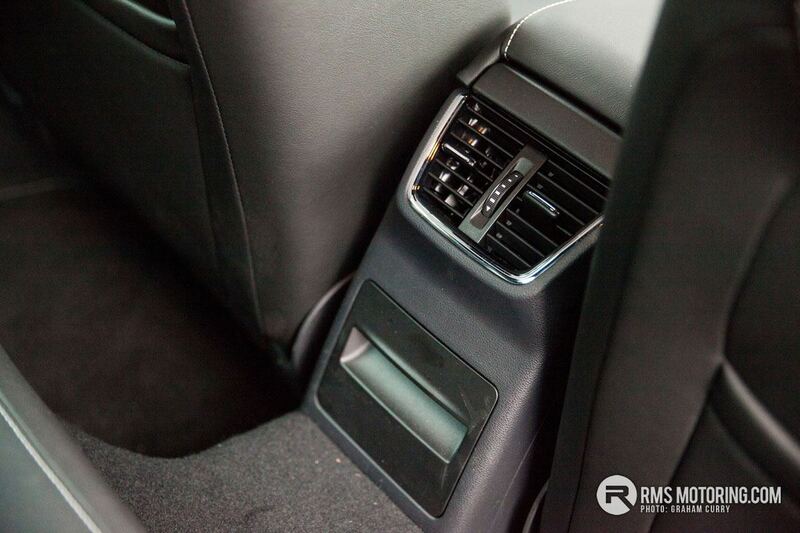 A ski-hatch in the centre of the rear seats allows easy internal transport of winter sporting goods whilst the split fold rear seats increase the rear space to a huge amount. 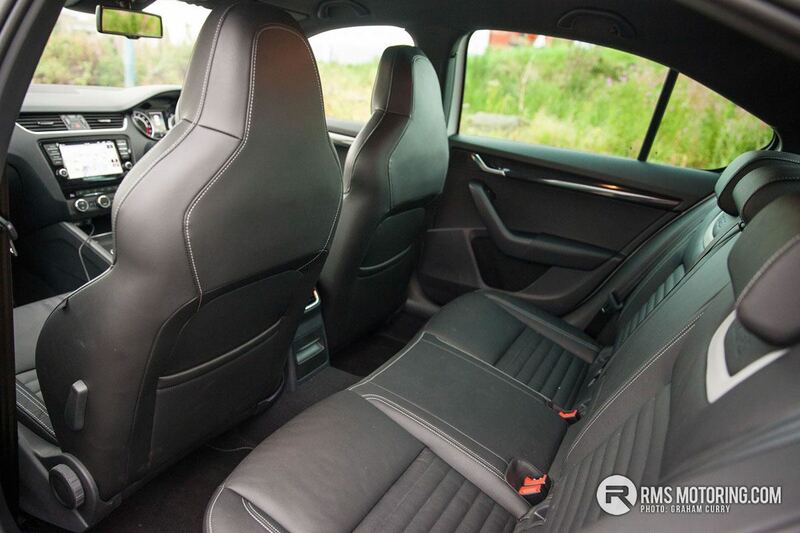 Inside the vRS provides plenty of room for four adults to take on a lengthy road trip in comfort especially with the £925 optional leather fitted while the front seats are heated at an extra £250. 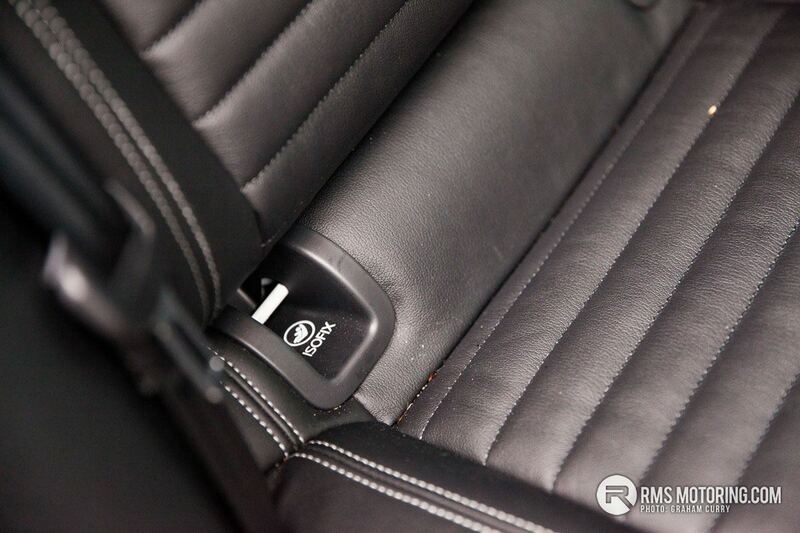 A central armrest both front and rear makes the long journeys much more pleasurable. 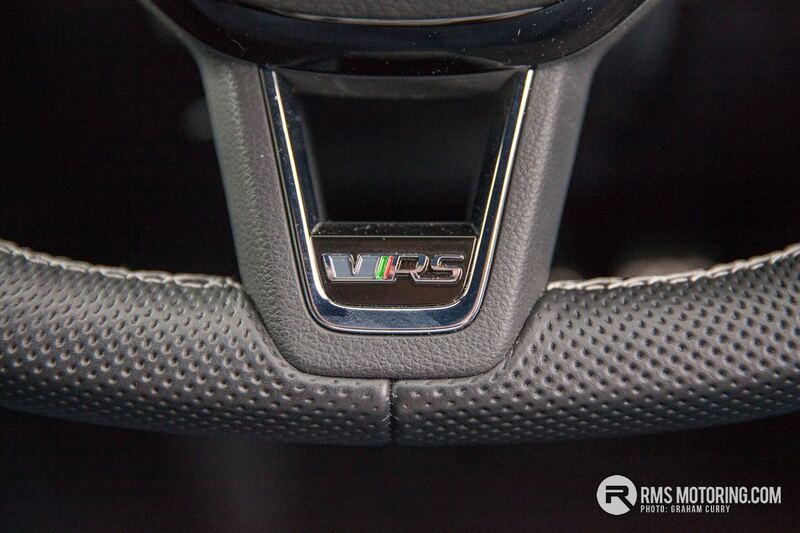 The stitching on the black leather seats is white with a white detail just below the headrests and a vRS logo is embossed into the leather just above this coloured detail. 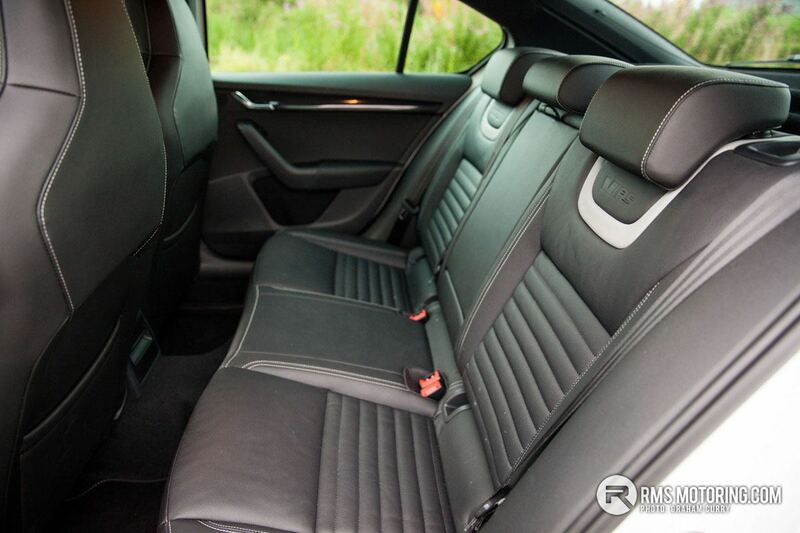 The front seats are more of a race inspired item with no adjustable headrest, instead the rear is a one piece sports item and indeed offer massive support in all the right places. 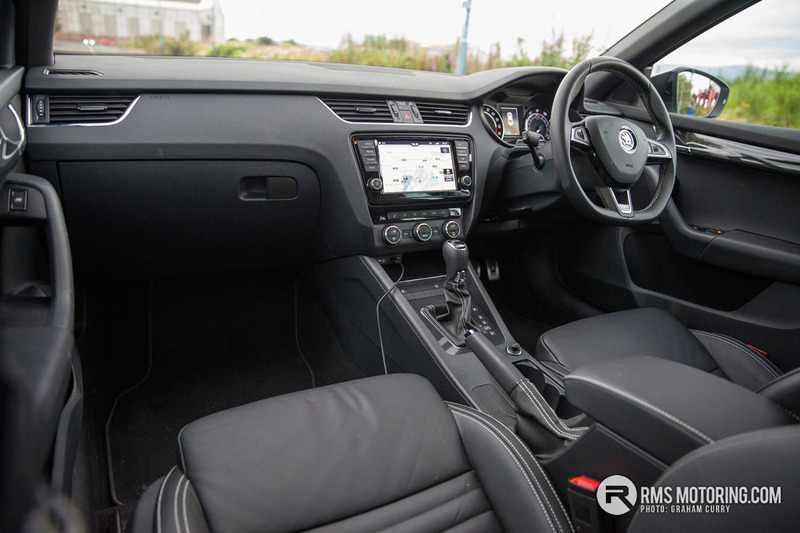 Infotainment is all too important with new cars and despite the vRS coming with a good system as standard, this model tested has an upgraded “Columbus sat nav system with wifi” at a cost of £1050 offering a larger than life screen with everything you can need. 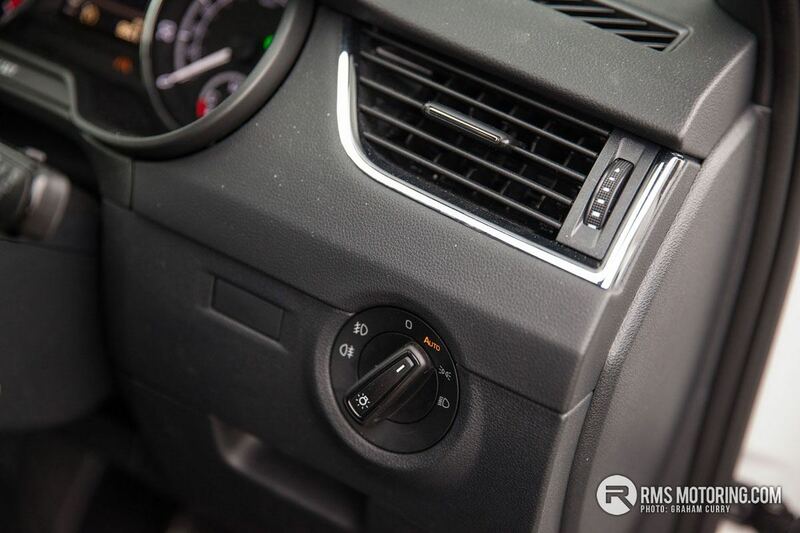 Sat Nav, Bluetooth, Radio, DAB Radio, media playback via Bluetooth | USB | AUX, vehicle data, traffic information, voice control and the vRS drive mode are all displayed and controlled via the screen. 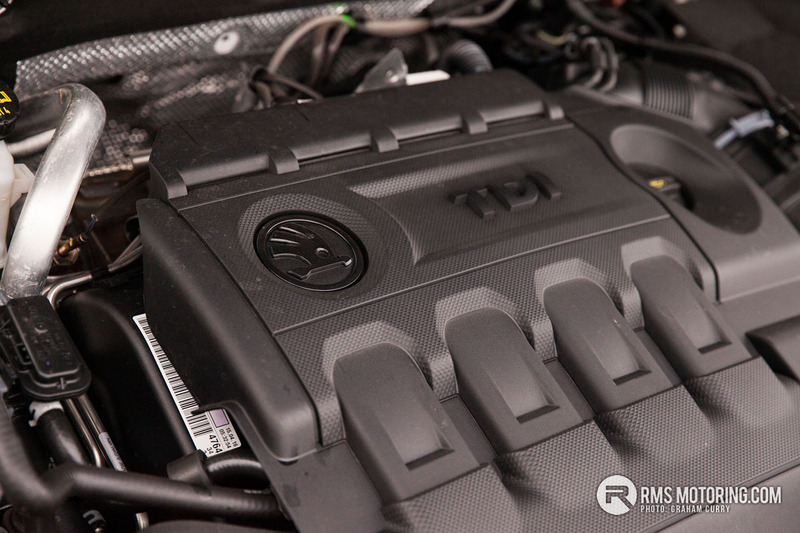 Engine wise this car is fitted with the 2.0 TDi as found in the VW Golf GTD [read review here] and produces a very healthy 180bhp with 280lb/ft of torque and via the DSG twin clutch gearbox propels from zero to 61mph in just 7.5seconds. 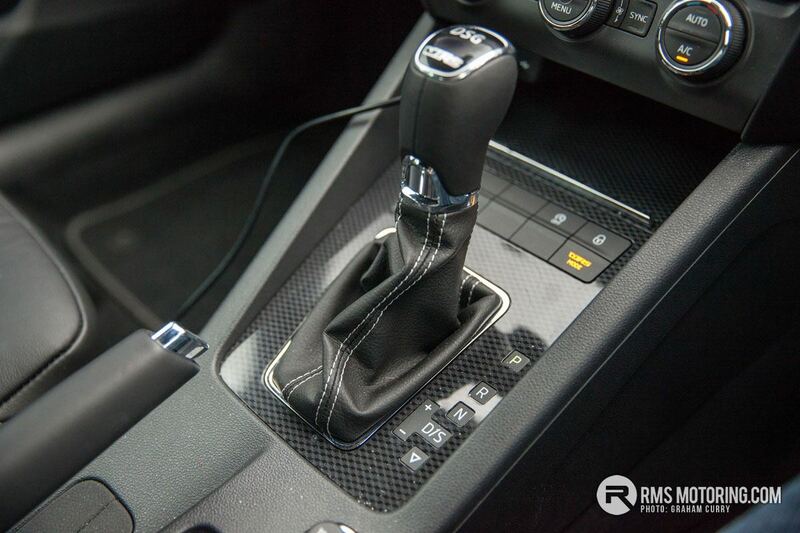 The engine, ‘box and 4×4 system work in harmony as the vRS pulls very well indeed through all the gears with plenty of grunt on tap as and when required and for ref the vRS is also available in front wheel drive and manual. 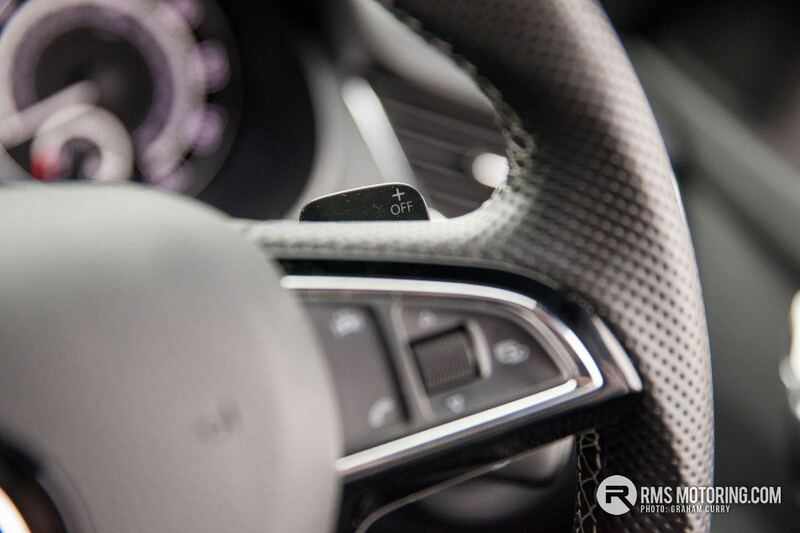 There is a ‘vRS Mode’ button housed beside the gear lever which allows a switch between the following driving modes – Eco | Normal | Sport | Individual and I must say this particular car is best enjoyed in Sport. 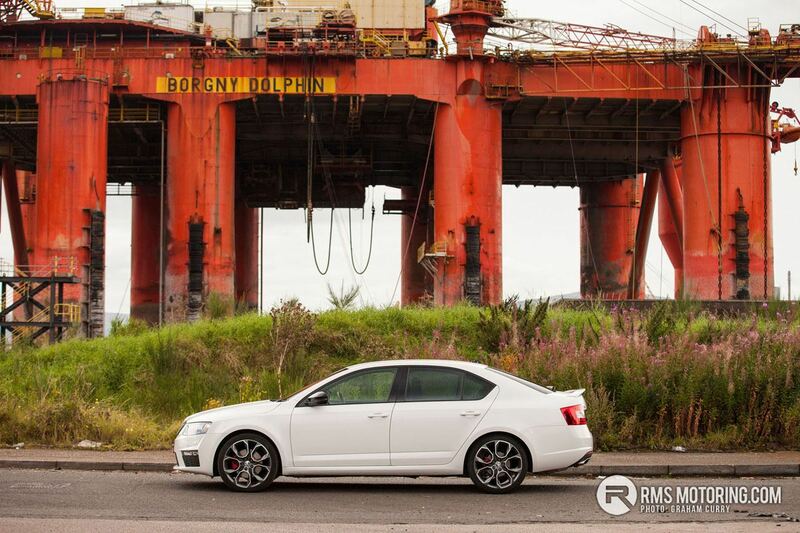 Being a reasonably heavy feeling car, the Octavia vRS handles great on all roads, though on very bumpy roads you know there is a bit of weight over the suspension. 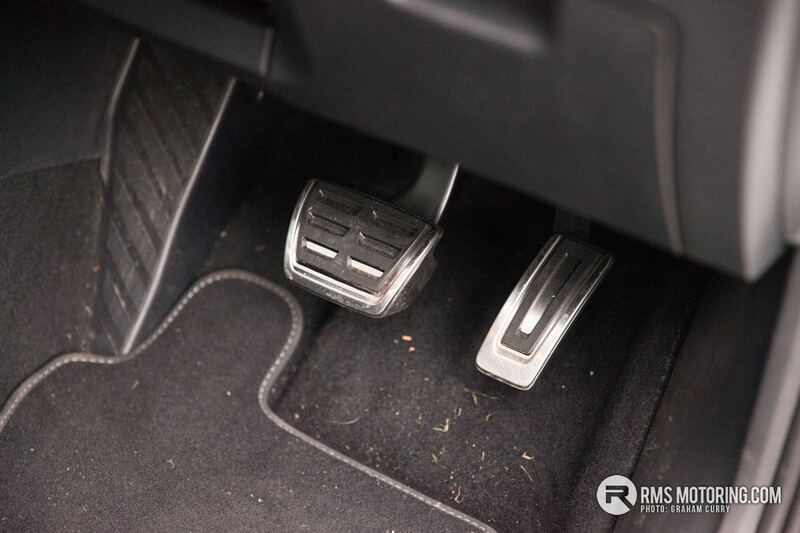 The all-wheel drive system keeps things safe and stable and indeed will suit the country living commuter who doesn’t want to sacrifice the sports feel of a car for an SUV. 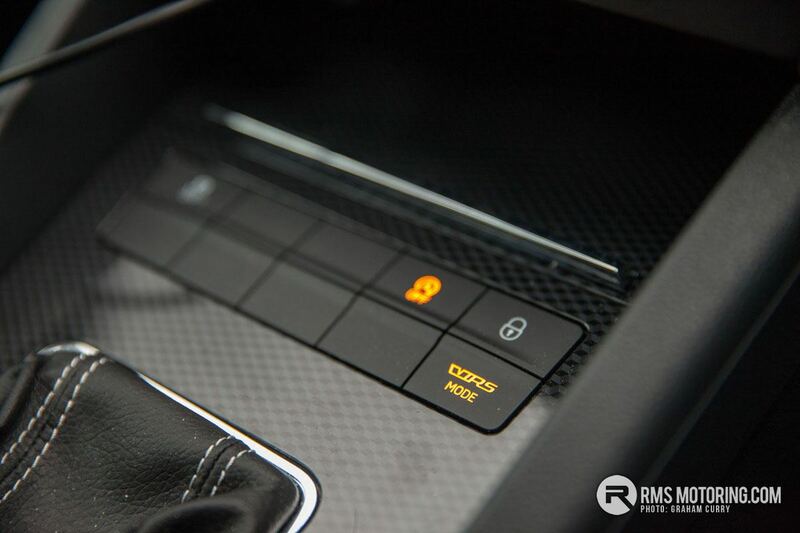 I don’t think I need to say much about the DSG ‘box other than it is a fantastic piece of kit and indeed one of the best systems on the market, I really do feel that if you only ticked one option when ordering a new Skoda that the DSG is the box to be ticked. 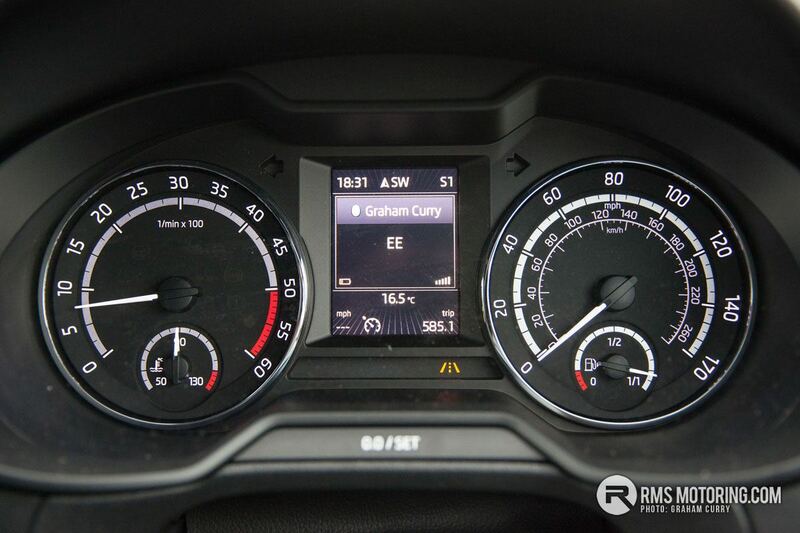 Also available in the vRS is an estate version as well as a 2.0TSi petrol engine across the vRS range producing over 200bhp with a 230bhp version also available, for me personally I must admit with real world mpg of the TSi being mid to late 30’s I would most certainly be opting for the petrol variant over the TDi as it is so much more fun. That said though, if I was a man doing 15k miles / year or upwards then this TDi model has the sports feel and spec with economy suited to the mile munchers as it is claimed to return high 50’s mpg though with my weeks test I found that to be more like mid 40’s over shorter runs and not getting onto the motorway much. Pricing for the vRS models starts at just shy of £25k with this model tested, being the 4×4 with DSG and some options coming in at a snip over £30k whilst annual road tax on the model tested is a very sensible £130. 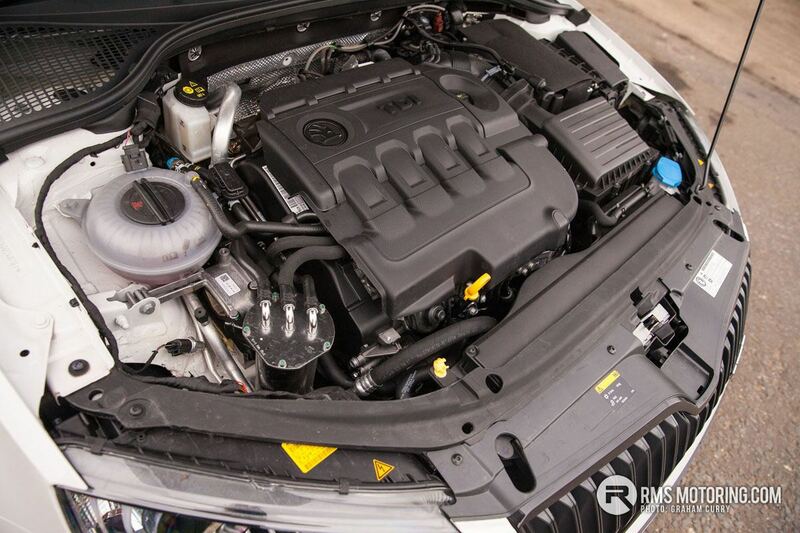 All in all, I still love the Octavia vRS and the only thing I would change about the car tested would be the engine, for no good reason other than I love the 2.0TSi petrol engines. 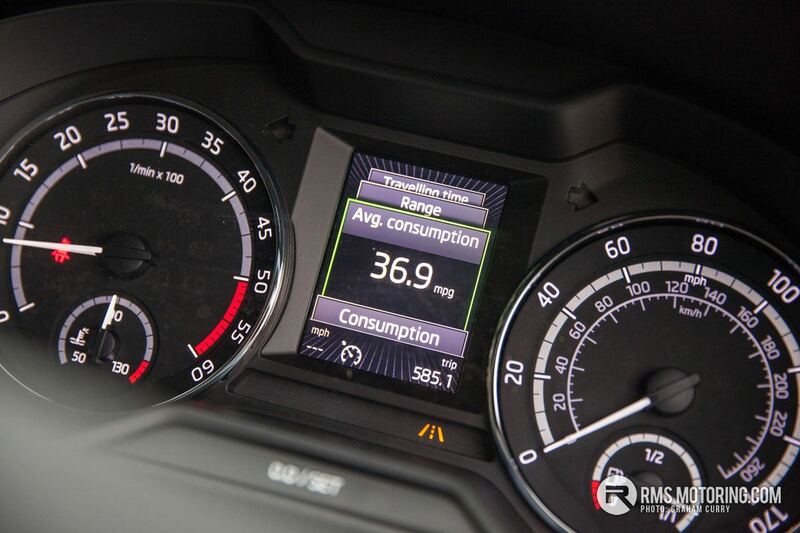 haven't drove the 4wd one but I've drove the fwd estate TDI, dsg and vrs amazing car. 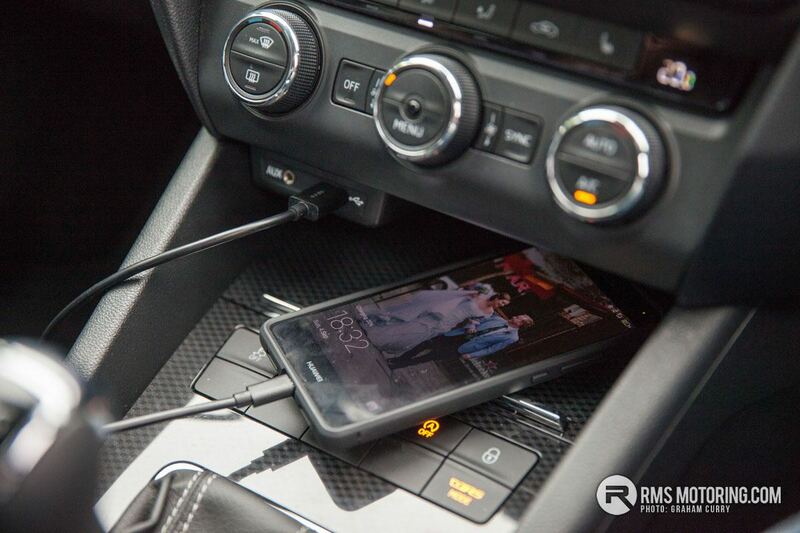 basically last years audi, no?